‘Sweet Kills’ – inducing fear or temptation? The theme for this year’s World Health Day is ‘Beat Diabetes’. According to the World Health Organisation, diabetes is expected to be the seventh leading cause of death by 2030 unless lifestyles change significantly in the meantime. Over the years we’ve created campaigns dealing with many of the complex health and social issues surrounding diabetes. These campaigns often target health professionals and people with diabetes. Specialist campaigns have addressed the needs of people from culturally and linguistically diverse communities, or emergency services professionals who need to know how to help people with diabetes plan their response to natural disasters. Most recently our Rise & Recharge campaign tackled diabetes side-on, by increasing awareness of the effects of prolonged sitting on our ability to process glucose effectively. 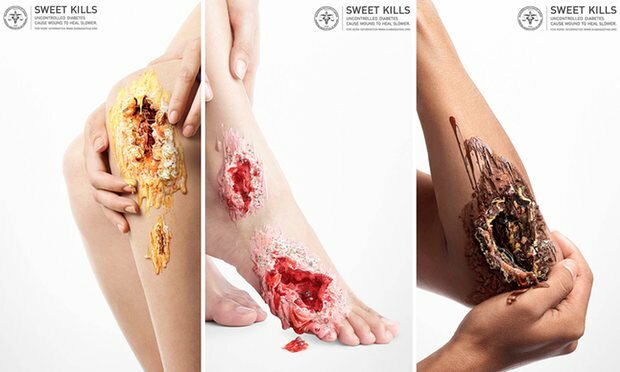 So when we came across the most recent ‘Sweet Kills’ campaign from the Diabetes Association of Thailand, we were intrigued. As a diverse team of strategic thinkers, content creators, designers, media experts and public health experts, opinions were divided. Do these slick, visceral images succeed in conveying the dangers of uncontrolled diabetes or does their strange beauty send mixed messages? Created by designer Nattakong Jaengsem, the campaign features tightly cropped images of gaping wounds to remind people of the potential impact of diabetes on the body’s ability to heal. At first glance, the images are horrifying. It doesn’t take long to realise that the wounds are made from confectionery (chocolate brownie, vanilla cake and strawberry cake, apparently). Can we be shocked and seduced? Social marketing campaigns that tackle public health problems such as tobacco control, road safety and sun protection have traditionally used shock tactics and fear to engage audiences. We’ve all seen it: gruesome images of organs destroyed by cigarette smoking and horrific car crashes showing wounded victims and the risks involved in speeding or drink driving. While the Thai diabetes campaign does present an element of shock with images of gaping wounds, is it likely to trigger an aversion to sugar, or is it likely to tempt us to give in to those strong cravings we try to fight multiple times a day? Having a public health background and an unrelenting sweet tooth, I was in two minds. I couldn’t decide whether this campaign made me want to steer clear of sugar completely or whether it enticed me into devouring a chocolate brownie. So, I asked some of the Fenton team what they thought. “This campaign brings to mind my childhood fear of little sugar-men chipping at my teeth with pickaxes after drinking soft drink, thanks Mum. Shock advertising is nothing new and while some research shows it has lost its effectiveness, there’s no doubt it gets people talking. “I can’t argue with the eye-popping surrealism and intensity of these images, and I think Sweet Kills is a memorable and provocative campaign name. At first the images appear to simply link sugary food with decay and death. The more complex underlying message that uncontrolled diabetes causes wounds to heal more slowly needs further explanation for people that don’t know about the condition. “Good on them for tackling sugar as a significant cause of health problems. I think we’re going to see far more focus on the health effects of sugar and increasing awareness of how much of it we consume in readily available food and drinks. I’d also like to recognise that this campaign was designed for Thailand, where there are different social norms and considerations.